" . 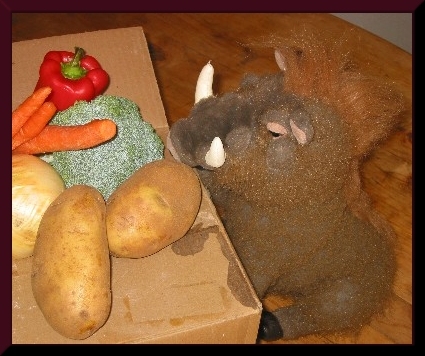 . . a carton of delicious root vegetables someone had left unattended . . . "
Note: On behalf of, as he enjoys being addressed, "Oh Supreme and Magnificent One", the author herein sets word upon page as dictated from the very mouth that consumes such volumes of pizza as would make growing male teens and football linesmen blush with wounded pride. Follow closely the intrepid spirit's journey as he breaks with centuries of family tradition and sets off on, what might be described by him, "an adventure even greater than that of a certain well known hobbit." Faced with such drivel, I ventured-off to find a better environment where my true talents and handsome visage might be more fittingly and fully appreciated. So I, after reading accounts of a (and I again deny baseless rumors that the only words I can read are, "the", "and", and "me") marvelous organization called The San Diego Zoological Association, made my way through the jungles and marshes of my homeland to find booking on a vessel of questionable origin headed for that promised land. The journey wasn't difficult for one such as I, for though it seems unnecessary to mention it here, most denizens of the Dark Continent do bow before me. Not one to hurry off without a proper meal or a least making plans for provisions, I thought it best to take my time and enjoy the various and exotic snacks found en route, dining upon plump grubs and delicious roots. Though the trip was long and sometimes arduous, I still managed somehow to modestly gain a few pounds as I made my way to the wave-swept coast. I might mention here that Jackals and Leopards tried their best to make my journey miserable. It seems with no other talent, that is their sorry lot in life. As you can clearly see, they failed. It was with some great cunning that I made my way onto a ship headed for the west coast of America. Yes, there was the problem with finding adequate food, as other passengers were somewhat reluctant to share repasts with one as - - 'unusual' as I. Finding a dark corner below decks, I napped away most of the trip, realizing the wisdom of having put on a few pounds prior to an otherwise uninteresting voyage. Passing through the Panama Canal, the ship steamed north toward my future, unknown at the time though it was. Some one week out from our point of my departure , I'd found a carton of delicious root vegetables someone had left unattended, most likely a sympathetic soul who realized I might be getting hungry. Truth was, I was, and without apology, I finished the entire box in one sitting. After that, I napped for the next three days. Rumors abounded of our eminent approach to an area on the map known as California. I, always prepared for change, made ready to abandon ship. The problem was, I didn't know how to swim. Ahhh-hem, I learned very quickly. Sand in my ears, and other places I shouldn't mention, I dragged myself from the surf near San Diego. After signing dozens of autographs for astonished tourists from Iowa, (they thought I was a surfer), I quickly made my way inland in hopes of maintaining some anonymity, though aware that it would be hard to pass for the animals I saw walking the streets. Hungry and a bit peaked by the demands of the journey, I began searching for something edible. Let me say here that the food served by those establishments referred to as 'fast' left much to be desired. Though dumpsters were usually full after dark, the fare was far less than palatable. What was to become of me? One would wonder. Certainly I did, but brave and powerful by nature, who was I to fall into the absurd clutches of worry. I need to take a nap, but please continue to follow my interesting journey as I find the time to recite my next adventure to the - - (I detest having to give him credit for this) author.